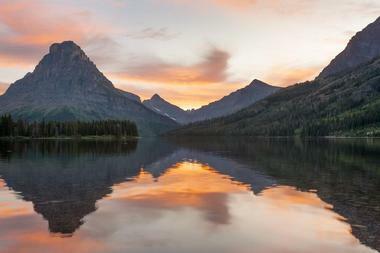 Glacier National Park in Montana is full of picturesque lakes, pristine forests, rugged mountains, and pristine forests. The park is a hiker's paradise with over 700 miles of trails for adventurous visitors who seek solitude and wilderness. Guests can relive the old days through historic chalets, lodges, and beautiful nature. Goat Haunt is one of Glacier National Park's more tranquil and remote areas, offering opportunities to discover the park far any crowds. The majority of visitors to Goat Haunt arrive from Canada's Waterton Lakes National Park by boat, but guests will also find that walking to this location to be enjoyable. Whether guests are boating or hiking, they'll be sure to spot the straight line of trees that have been cut that mark the International Boundary between the United States and Canada. The Goat Haunt area provides a peaceful escape for visitors looking to get away from the stress of daily life. During the season, staff from Glacier National Park and Waterton Lakes National Park guide the International Peace Park Hike together south into Goat Haunt. 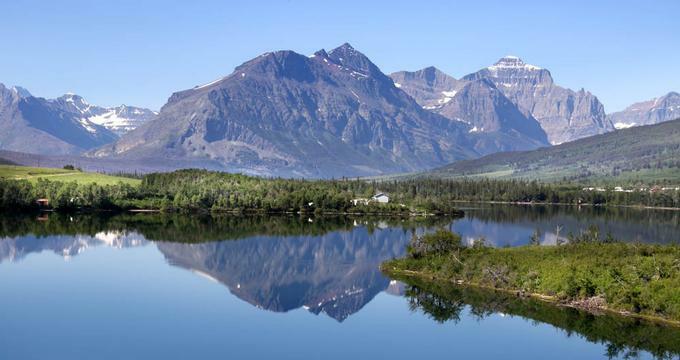 Visitors then return to Waterton Lakes National Park by boat aboard the historic International. Waterton Lakes National Park and Glacier National Park were established as separate parks and are independently managed, however, the park were joined in 1932 by the Canadian Parliament and the United States Congress to honor the long-lasting peace between the United States and Canada. The Waterton-Glacier International Peace Park was then established and became the first international peace park in the world. 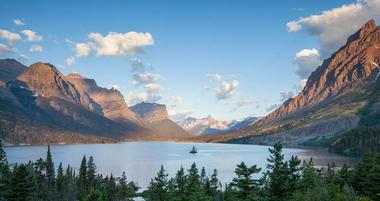 The center of activity on Glacier National Park's west side is the Lake McDonald Valley. The area was once home to colossal glaciers that carved the valley thousands of years ago. Hiking trails, astounding sights, numerous species of animals and plants, historic chalets, and the grand Lake McDonald Lodge now fill the Lake McDonald Valley. Lake McDonald, stretching 10 miles long and almost 50 feet deep, is the largest lake in Glacier National Park and is a direct result of glacial carving. Not only did these powerful glaciers carve the broad "U-shaped" valley in which the lake is located, but they carved smaller hanging valleys with spectacular waterfalls that are accessible by many hiking trails as well. The popular Avalanche Lake and Trail of the Cedars day hikes originate from Lake McDonald Valley. The Trail of the Cedars is wheelchair-accessible. There are shuttles that can transport visitors to these trailheads, as well as to other destinations throughout Glacier National Park. Situated along Lake McDonald's shore is the historic Lake McDonald Lodge. The building was constructed in 1913-1914 with Swiss influenced architecture, and resembles a rustic hunting lodge. Visitors can spend the night in this warm and inviting lodge during their visit to the park. Guests can sit in front of the huge fireplace or participate in a Ranger-led program after a long, tiring day of hiking or exploring. Clements Mountain and Reynolds Mountain rise above the fields of wildflowers carpeting the ground during summer at Logan Pass. Fields of yellow glacier lilies push up through the snow, with an array of alpine plant taking their place shortly after. These alpine plants are well adapted to the harsh, but stunning environment. The area is the highest elevation accessible by car in Glacier National Park. 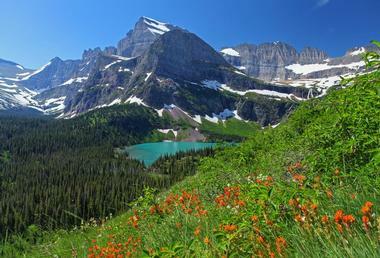 The Highline Trail and the Hidden Lake Trail are two of the most popular hiking trails in Logan Pass. Visitors might just get to see the occasional grizzly bear, bighorn sheep, or mountain goats wandering through the meadows. For the best chance at viewing the wildlife of Logan Pass, guests should arrive early in the morning before the crowds arrive. The light in the early morning provides an excellent opportunity for some great photographs as well. The area's ecosystem is also home to some animals with incredible abilities, creatures that almost seem to have superpowers. These animals have special adaptations to help them survive at this elevation and habitat. Outside of the Logan Pass Visitor Center are exhibits where visitors can learn about these creatures special abilities, how they live in the environment of the park, and how climate change may be creating a more difficult life for them. 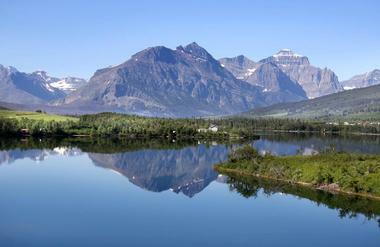 Many Glacier is often considered to be the heart of Glacier National Park. The area's active glaciers, hiking trails, sparkling lakes, abundant wildlife, and massive mountains make Many Glacier a favorite spot in the park with both visitors and locals. Guests can reach the area by foot, car, boat, or even horseback to get an up close look at the glaciers and the landscape they have created. This location is a paradise for hikers. Trails branch off from Many Glacier in every direction, including the Iceberg Lake trail and the Grinnell Glacier trail, two of the park's most popular hiking trails. For a week, hikers visiting Glacier National Park could hike a different trail every day and still not even cover all that the Many Glacier area has to offer. During the spring, bighorn sheep come closer to the Park Road. Also, the late summer months offer the most ideal time to possibly see both grizzly and black bears eating huckleberries on the slopes above the Swiftcurrent Motor Inn. 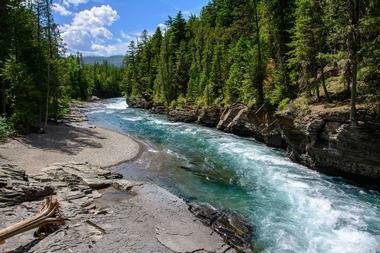 Visitors will find The North Fork area of Glacier National Park is one of the park's most uncrowded areas. This section of the park is accessible via unpaved roads by private vehicle. Those that travel to The North Fork are treated to views of Kintla Lake and Bowman Lake, opportunities to hear and view rare park wildlife, a living laboratory of forest succession in recently burned areas, and a homestead site. As a result of a series of fires over the last twenty years, a wide mix of forests of various ages. Each of these types of forests attract a somewhat different complement of species. Fires in 2004 have provided expansive areas of habitat for rare woodpeckers, such as the Northern Three Toes woodpecker and the Black-backed woodpecker. St. Mary Valley is the eastern entrance into Glacier National Park. A diverse, rich environment for animals and plants is created here through the convergence of mountains, forests, and prairies. Visitors have a chance for great wildlife viewing thanks to dense forests surrounding open meadows. A drive along St. Mary Lake, stretching nearly 10 miles, offers incredible vistas, some of the best in the entire park. Native American culture and history is strong in the St. Mary Valley as the area borders the Blackfeet Reservation. Members of the Blackfeet, Kootenai, and Salish tribes participate in Glacier National Park's Native American Speaks program. This program showcases local drummers and dancers, as well as award winning performing artists, at the St. Mary Visitor Center. Two Medicine was formerly a main destination for travelers arriving by train, back before the construction of the Going-to-the-Sun Road. Visitors would spend a night at the Glacier Park Lodge, then would travel by horseback to Two Medicine and stay the night in one of the many rustic chalets or canvas tipis that were built by the Great Northern Railway. From here, a system of backcountry chalets and tent camps within Glacier National Park let these travelers live the park's wild interior. Both day hikers and backpackers find the Two Medicine area abundant in scenery, offering visitors willing to travel into the mountains on food with a real wilderness experience. Guests looking to venture off the road and into the wilderness, but not looking to hike, can enjoy the scenery with a boat tour on Two Medicine Lake. Two Medicine, today, is a slightly off-the-beaten-path are for park visitors to discover. With its extensive trails, spectacular vistas, shimmering lakes, and gushing waterfalls, it's not hard to understand why many visitors consider the Two Medicine area to be their favorite section of the park. 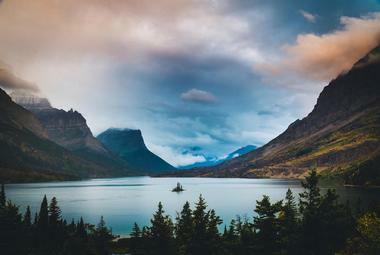 There are numerous things to do in Glacier National Park, including hiking, camping, boating, and photography. The park has over 700 miles of trails, offering great opportunities for anything from a short hike to an extended backpacking trip. Some trail are self-guided walks with interpretations of trailside features on sign or brochures. Several nature trails encourage hikers to explore the park at their own pace, such as the Trail of the Cedars, Hidden Lake, Swiftcurrent, Forest and Fire, and Running Eagle Falls. The Running Eagle Falls trail and the Trail of the Cedars are both wheelchair accessible. Visitors can also take part in several different hikes, both day hikes and overnight trips, with a ranger during the summer and winter. Hikes are also led by rangers and boat captains in connection with specific boat tours in the park. Hikers exploring the backcountry of Glacier National Park will find the area split into two different sceneries, divided roughly by the Continental Divide into east and west. The east side of the Continental Divide contains terrain that is more sparsely vegetated than the west, offering open vistas. This however also attracts more crowds. Trails on this side begin at around 5,000 feet in elevation. The west side of the divide is more densely forested, providing a great area for visitors seeking solitude. Trails here begin at around 3,200 feet. Glacier National Park contains 13 specific campgrounds and approximately 1,009 campsites from which visitors can choose from to enjoy a campfire and sleep under the stars. The park is also a photographer's paradise, with its sweeping vistas, glaciers, wildflowers, waterfalls, wildlife, and picturesque sunrises and sunsets over the lakes. 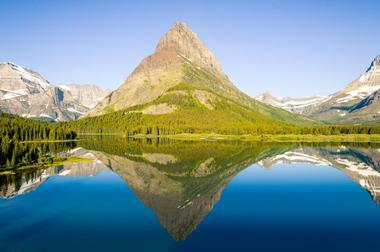 Back to: 25 Best Places to Visit in Montana.